Jan 2012: Here’s my early prediction of the outcome of this year’s US Presidential election. 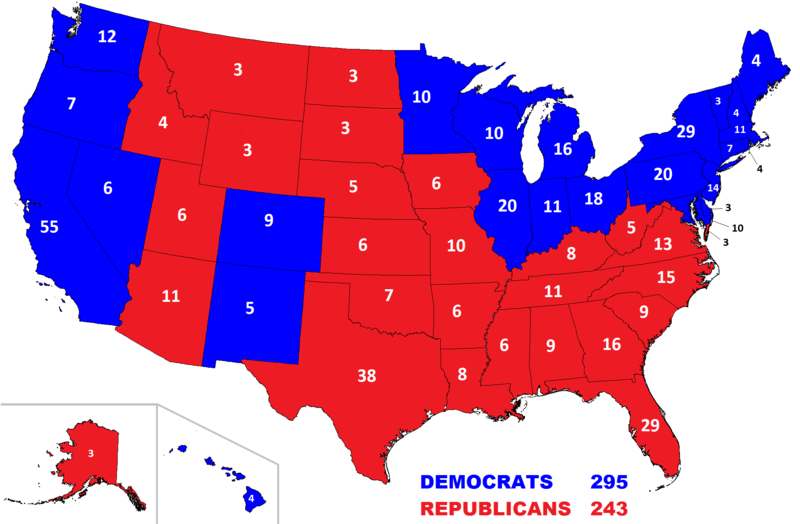 I think Democratic candidate Barack Obama will narrowly win a second term as President with 295 electoral college votes, just ahead of his Republican rival on 243. I expect the Republicans will eventually nominate Mitt Romney to be their candidate. However if the dramatic result of the GOP caucuses in Iowa is anything to go by, it certainly promises to be a fascinating contest. This entry was posted in Political, World and tagged 2012, Barack Obama, Democrats, electoral college, Mitt Romney, presidential election, Republicans, USA by Sundip. Bookmark the permalink. I think the USA electorate should uphold Barack Obama for the second presidential term, considering that he came in when the adverse global economic circumstances were already beyond his immediate control and which were unlikely to improve in the short term no matter what desirable changes he made. It is therefore unlikely that a new president would make any worthwhile economic impact at this time. So, why not let President Obama continue and allow him to build on the experience he has gained? Well, the Republicans don’t want Pres Obama, mostly because he’s black and doesn’t agree with them. But, to the President’s credit, as far as I am aware, he has never played that trump card. I believe he could do a good job; but it’s difficult to work with people who refuse to be cooperative. Having said that, politics is the only job in the world where one can sit back, cross his arms and say, “to H__l with you! I will not work with you. The rest of us would be in the bread line if we did that.